It is likely Tokyo will want Europe to reciprocate, and commentators are quick to draw parallels between Russia’s actions in the Donbass and Crimea and Chinese actions in the South China Sea in providing an answer to how Europe can respond. Given Europe’s extreme reluctance to apply sanctions against Russia, it seems unlikely to lead the way in reciprocating Japan’s efforts in the South China Sea, nor do Europeans see the benefit of picking sides. The many kowtow missions of European premiers to Beijing demonstrate that confronting China is not on the agenda in Europe. Taking the realities of European limitations in to account, what can Europe offer Japan – or to put it more precisely what can Japan gain from Europe – that could provide an edge other “regional competitors” are unable to access? A few key areas come to mind, such as Europe’s defense industry, the NATO alliance, and intelligence on the Middle East and Russia, knowledge of which can be applied to the Asia Pacific. Moreover, Japan could learn from the experiences of European militaries in smaller-scale overseas operations. The Japanese government has led the way on defense industry, with Abe’s government pushing through legislation that makes limited defense equipment export possible. This has allowed broader international engagement in the defense sector, with both Europe and the likes of India and Australia. Mitsubishi Heavy Industries, Japan’s largest military contractor, publicly welcomed the move, and steps have been taken and agreements with a variety of European nations have been signed. It is relatively clear with whom Japan hopes to do business: France, Germany, Italy, Sweden and the U.K. come to mind. This engagement surely has some potential, and could allow Japan to improve its defense industrial output quicker than regional competitors can, increase exports, and lower domestic unit costs. It may also learn lessons unique to Europe, such as how to complete multilateral projects without involving the U.S. However Tokyo lacks a coherent strategy as to how arms exports fits in its overall strategy. Following the drawdown in Afghanistan and NATO’s return to a more traditional posture, Japan can also learn a great deal from NATO’s European members on multinational operations and interoperability. The enormous U.S. military is not a suitable structural or operational model for the SDF, which is far more likely to be engaging in state building and peacekeeping operations in the medium term. Europeans individually, and NATO collectively, could pass on some meaningful lessons in overseas operations in the face of limited budgets and limited political will. A case in point is Japan’s new amphibious force: While the U.S. Marines have helped Japan enormously in this area, the Marine Corps’ ambition and doctrine do not correspond with Japan’s goal: The Corps alone has more service members than Japan’s entire Ground Self-Defense Forces. For Japan, the Swedish Marine Regiment or the U.K.’s Royal Marines could provide a structural, funding and operational model that more closely matches the ambitions of Japan’s new amphibious force. Similarly the In Amenas crisis in Algeria and the murder of two Japanese citizens by the Islamic State demonstrated an inability to effectively gather intelligence and respond accordingly. Japan could learn from the U.K. and France about this volatile region that has demonstrably affected Japanese interests. Europe’s knowledge of Russia, particularly in relation to asymmetric military operations and the baiting of NATO, could also serve Japan in the Asia-Pacific. Such a knowledge exchange need not be a one-way street: in the second decade of this “Asian century,” Japan’s regional intelligence gathering and knowledge of China will be valued by Europeans with limited resources. 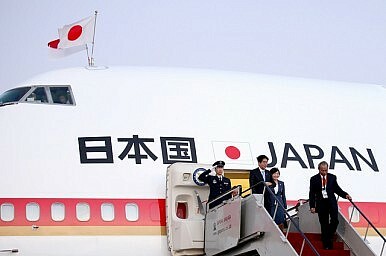 With the U.S.-Japan alliance remaining the cornerstone of Japan’s security policy, Europeans are unlikely to play a significant role in Japan’s defense. Indeed, it would be folly to believe engagement with Europe could significantly alter the geostrategic balance in the Asia-Pacific. Moreover, European nations are reluctant to take any action that could be perceived as “China containment.” However, Japan’s economy and demography are going in troubling directions, and as a result its influence in the Asia-Pacific is unlikely to increase markedly in coming decades. It is these realities that require Japan to be confident and clear in what it wants to sell to, learn from, and collaborate with Europe, and then do it. Jonathan Davis recently graduated with an M.A. from King’s College London’s War Studies Department and was a summer researcher at Temple University Japan’s Institute for Contemporary Asian Studies. The EU-Japan Partnerships: Advancing the Abe Doctrine? Analyzing the EU-Japan Economic Partnership Agreement (EPA) and Strategic Partnership Agreement (SPA) in context.